Happy FriYay everyone! I don't know about you, but this week has been a long one, and I couldn't be happier that the weekend has arrived. I have my niece's first birthday party this Saturday, then after, I'll probably head up to the lake for the night. Speaking of Friday, isn't this a perfect weekend look? 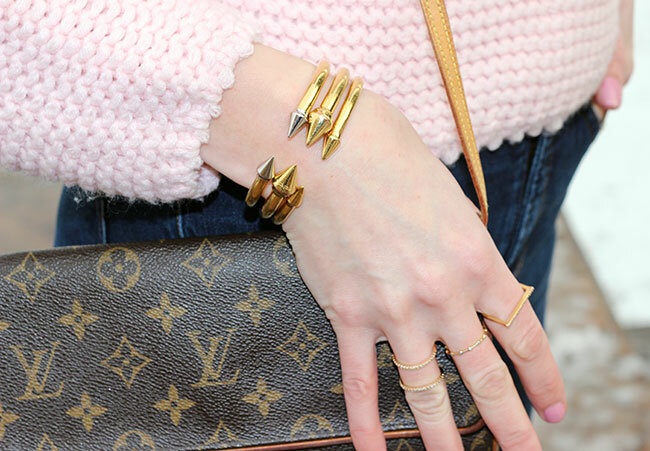 This sweater is my new crush, and I have a feeling it will be a staple in my closet. 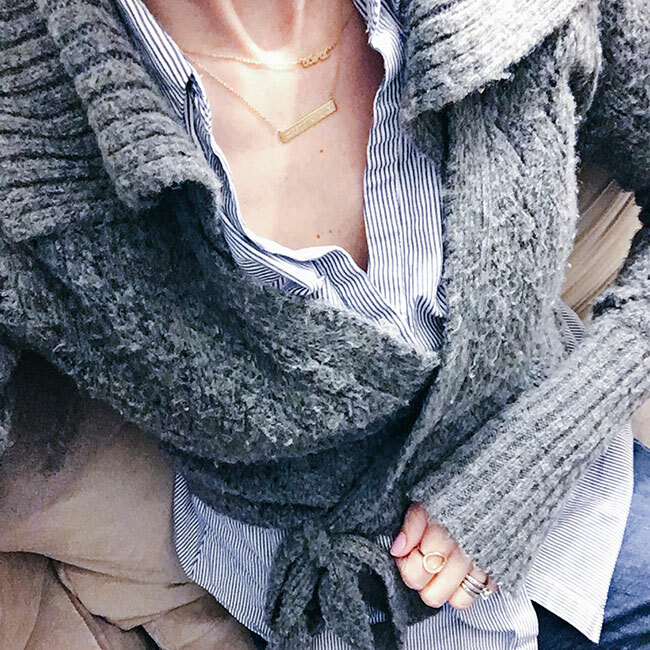 Most of you know how I love basics with a twist, and that I love to layer, and this sweater combines the two together perfectly. The floral under layer is built in, giving you a perfect finished look. It's from PinkBlush, another new obsession of mine. If you're not familiar with PinkBlush, it's an online shopping site with comfortable, yet trendy, affordable clothing. They have a great selection ranging from tops to leggings, but I'm especially loving their dresses and knits. Plus, PinkBlush is known for their maternity clothing, which I wish I new about when I was pregnant (so to all my friends/readers who are pregnant, go check them out now!!). I'm also very excited to be giving away a $50 gift card to PinkBlush to one of my readers (you can enter using the Rafflecopter link below). Good luck! Thank you for reading and linking up! I wish everyone a great weekend. There are two items that I can't get enough of this winter: turtleneck sweaters and over-the-knee boots, and together they make one great pairing. This turtleneck sweater dress is another great find from Chicwish, and I wasn't lying when I told you it has become one of my favorite online shopping sites! You can check out some of my other recent Chicwish looks here and here. Not only am I loving the fit of this turtleneck, but the chiffon sleeves add a fun contrast. Although technically a dress, it was a tad too short for my thirty something-year-old self, and decided it would work best as a tunic. I threw it on over a pair of legging jeans, and finished my look with a leather jacket and OTK boots. If you're looking for a more affordable alternative (dupe) to the Stuart Weitzman Highland boot, then I highly suggest these Steve Madden ones. 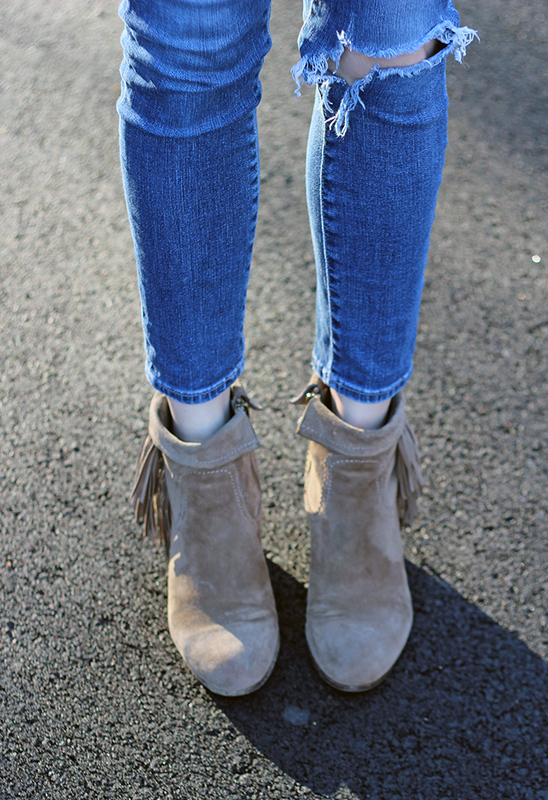 I'm so happy I bought them, and have a feeling they'll be making many appearances on the blog this season! Happy Monday everyone! 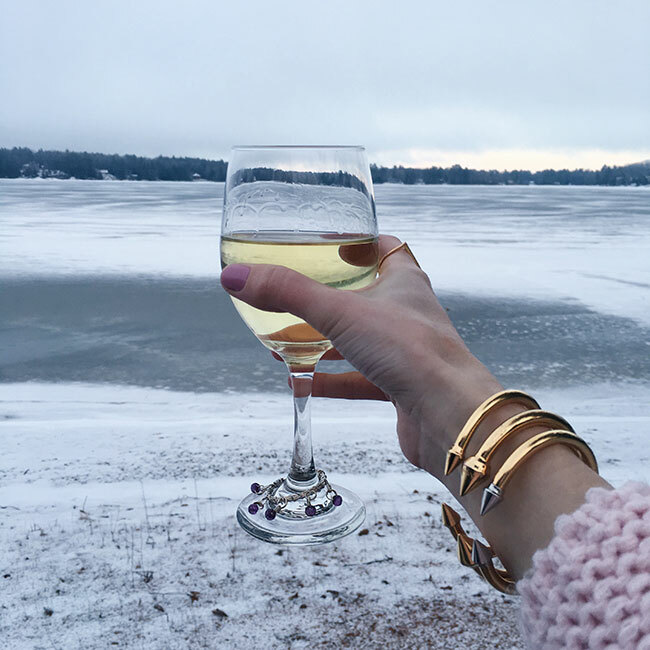 For all of you who live on the East Coast, I hope you survived storm Jonas! I was a little bummed as we only got three inches of snow here in Boston. But then again, two days after a big snow storm, I always wish that the snow was gone, so I guess I'm happy we didn't get hit. 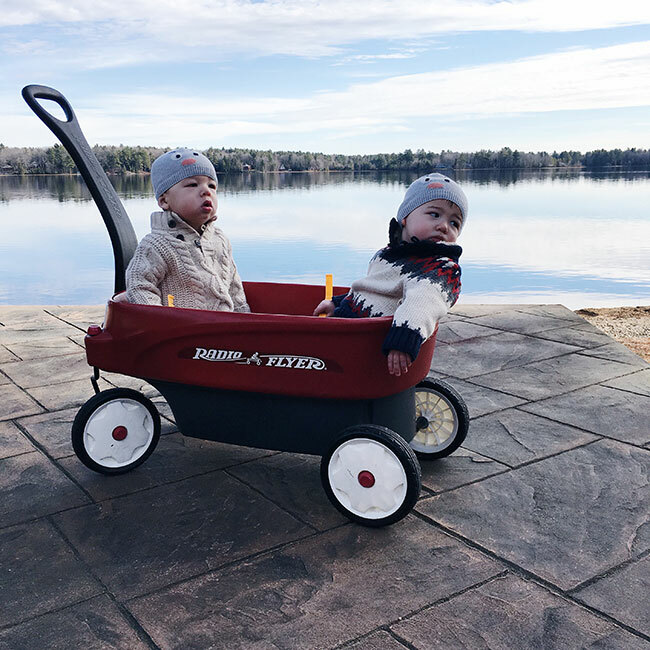 I thought I'd start out the week by sharing some of my most liked Instagram photos over the past month, since not everything makes it onto the blog. 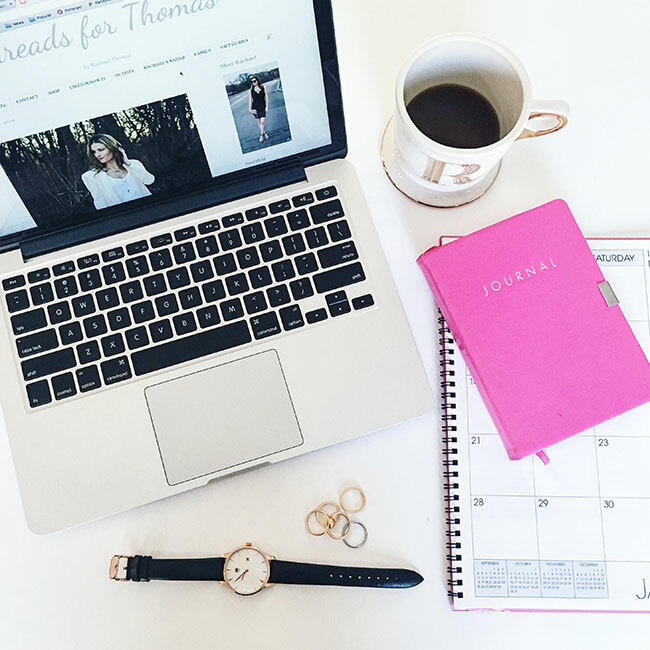 Make sure to follow along @thomasrachael! 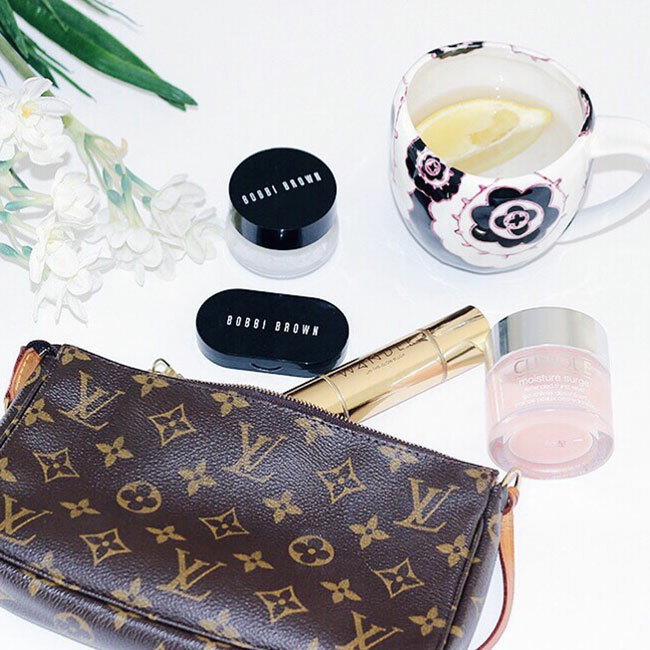 Some of my current beauty favorites. This concealer is amazing at covering up dark circles, and the Clinique Moisture Surge has done wonders to my skin. I normally have extremely dry skin in the winter, but haven't seen a flake since using it. Not to mention how silky it feels against my skin! Cocktail hour at my sister's lake house. I'll never tire of this view! Started the year off with a new computer, and getting organized. Bring it on 2016! 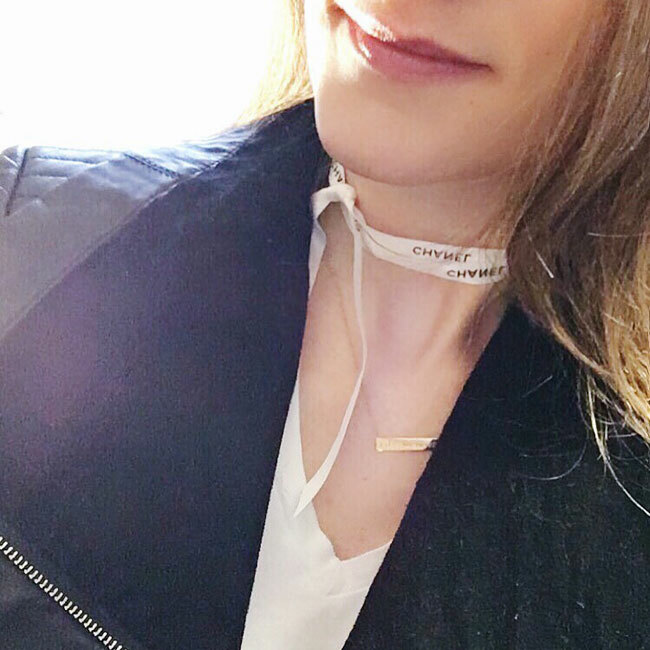 Is anyone else into chokers? I decided to make my own using a Chanel ribbon, what do you think? Of course I had to include a photo of these cuties! Make sure to follow along on Instagram! I wish everyone a great week ahead, and thank you for stopping by. The other night I did something that I had never done before. I took a pair of scissors and cut up a pair of jeans. Those who know me, know I am not a DIYer, so the fact that I even attempted this made myself proud. I have to admit, I was impressed with the finished product. 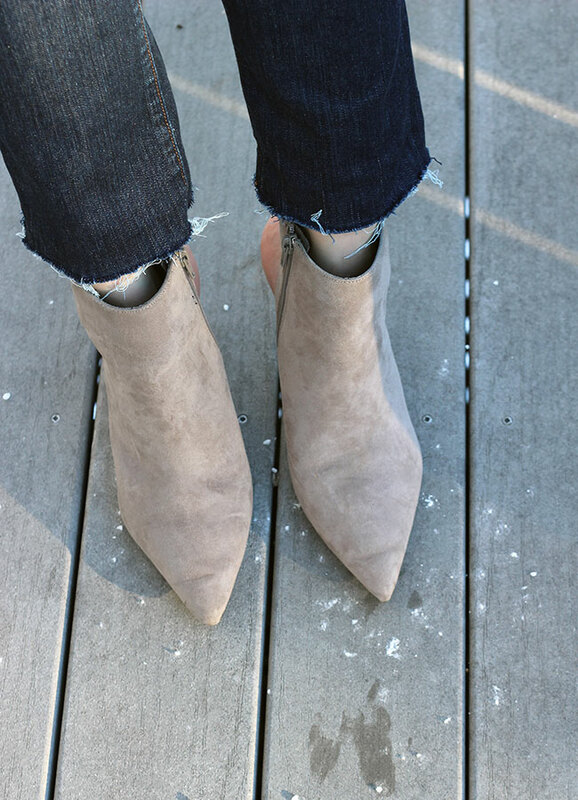 I had been wanting to add a pair of cropped, frayed hem jeans to my wardrobe for a couple of months now, but if you saw the amount of jeans that are in my closet, you would understand my hesitation to add another pair. That's when I convinced myself that I could DIY them. So I googled "how to cut and fray jeans" and in a half an hour I had myself a new pair! I styled them with a button down and booties for a classic look, but can't wait for the warmer weather so I can wear them with flats (and not freeze). Now, I am wondering what else I can DIY... I think I may have a new addiction! I used a pair of straight leg jeans (12" leg opening) so they would have a semi-flared look. I also can't wait for them to get better over time, as washing them will make them even more frayed and tattered! 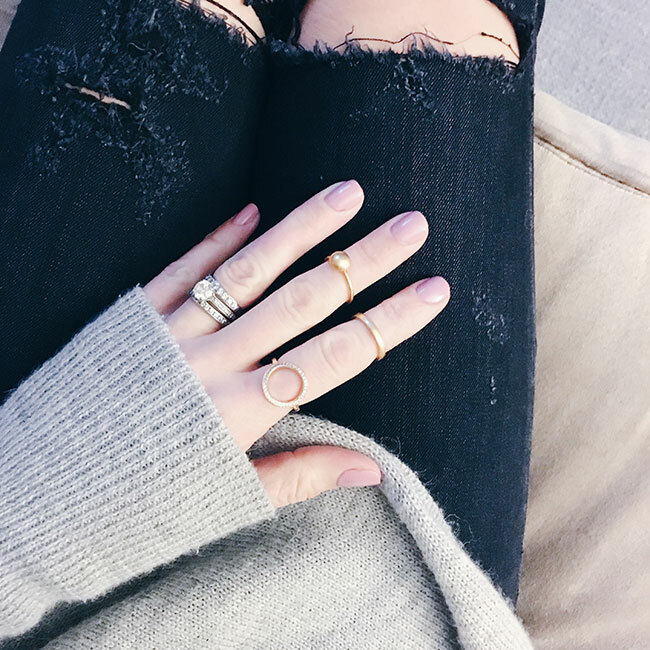 If you like the look, I linked some similar options below, or leave me a comment if you would like me to do a post on how I altered my jeans. Thank you for reading and linking up! I wish everyone a great weekend! As many of you probably know, last month PANTONE named Rose Quartz and Serenity the color of the year 2016. It's the first time that two shades were chosen and blended in becoming the coveted shade, and I couldn't be happier. 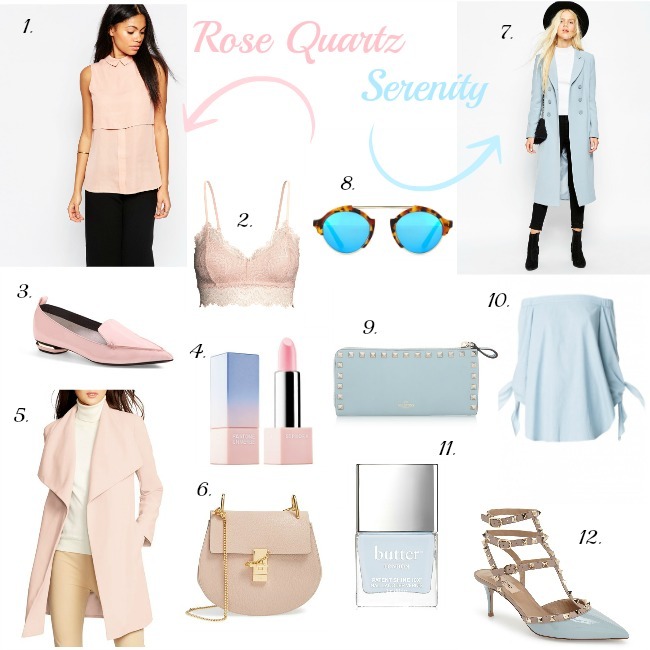 If you have been following this blog for sometime, you know that the soft pink hue is one of my favorites, and I can't wait to add the cool shade of blue to my wardrobe. Not only are these shades perfect by themselves, but together they make a beautiful pairing. The softer colors are also ideal for transitioning into spring. 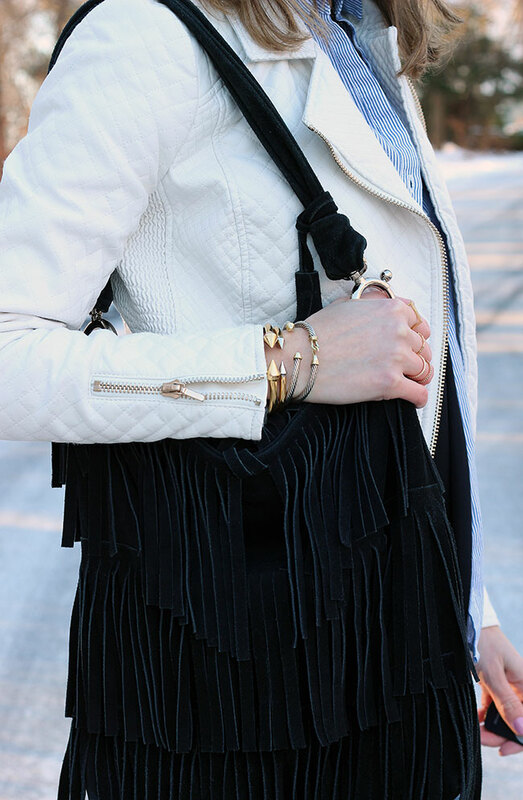 Try adding them into your wardrobe now with a fun bag, cute flat, or even some nail polish. Happy Monday and Martin Luther King Jr. Day! How was everyone's weekend? I'm still recovering from mine. I spent Saturday with my mom and sister, and I couldn't of asked for a better time. We were all up at the lake, at my sister's house, and had a night of stuffing our faces with great food, while watching the Patriots game. That's where these photos were taken, can you believe that this is my sister's back yard? Even when the lake is frozen, the view is still beautiful. I wore my new sweater from Chicwish, which I have been wearing non-stop since its arrival. 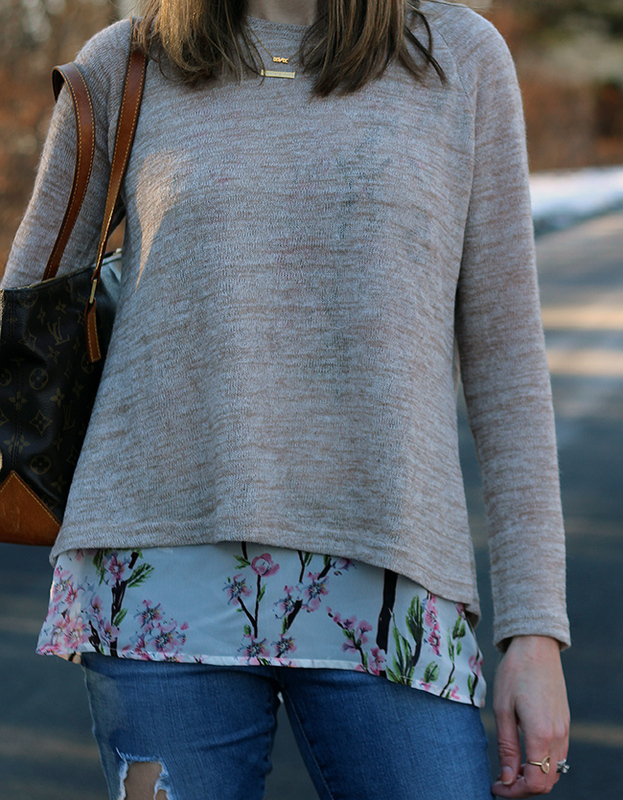 There is nothing better than a cozy knit in the winter, and I love how this one is so fun and feminine. 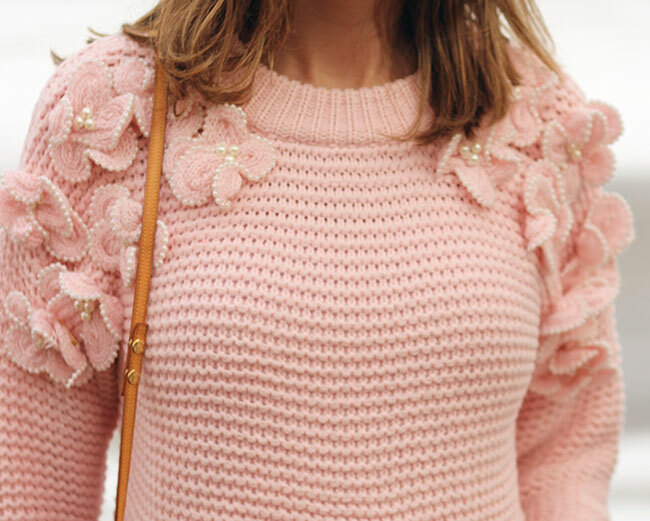 If the pink color isn't girlie enough for you, then the floral and pearl details should do the trick! I wore this sweater last week (seen here) with jeans and blush pumps for a dressier look, but decided to go casual this past weekend, and paired it with my UGG boots. I can also see myself styling this sweater in the future with a midi skirt for an ultra feminine look. PS. if you're not digging the pink color, it also comes in white and grey. Yes, I'll be the first to admit that I still wear my UGG boots, and am happy that they are somewhat back in style. Living in New England, I have a collection of winter boots, but lately my Uggs have been my go-to. Not only do they feel like I'm wearing slippers, but I love that I can easily pull them on. Lace-free is something that is key when you're trying to get out the door with two toddlers in hand. I hope everyone is having a relaxing Monday. Thank you for reading!